Rival groups are bitterly battling each other to gain the official nomination to run the EU referendum Brexit campaign. 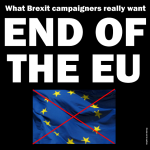 Three campaigns with different visions of Britain after Brexit have applied to the Electoral Commission to be designated as the official ‘Leave’ group. Only one group from ‘Leave’ and one from ‘Remain’ can be awarded the title, each giving them access to government funding, mail shots and media broadcasts. But there is only one Remain campaign group – called Britain Stronger in Europe. It has no rivals and it is united and clear in its vision for Britain staying a member of the EU. 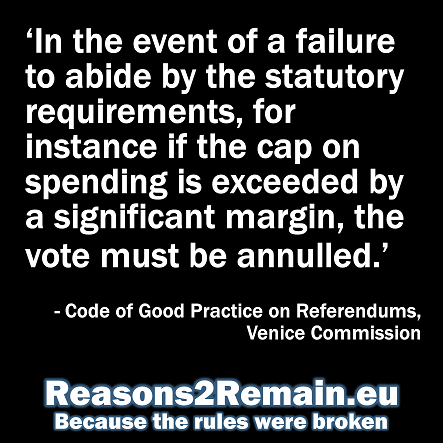 A decision will be made by the Commission by 14 April at the latest. The Brexit rivals include ‘Vote Leave’ which is backed by some Tory ministers and grandees, such as the London mayor, Boris Johnson, Michael Gove, Chris Grayling, John Whittingdale, Theresa Villiers and Iain Duncan Smith. ‘Vote Leave’ also includes UKIP’s only MP, Douglas Carswell, who is reportedly no longer on speaking terms with his party’s leader, Nigel Farage. Pitched against ‘Vote Leave’ is ‘Grassroots Out (Go)’ which includes Nigel Farage, with the backing of some Conservative, Labour and DUP MPs and the millionaire UKIP supporter Arron Banks. And the ‘Trade Union and Socialist Coalition’ has also applied to the Electoral Commission to run the official campaign to get Britain out of the European Union. There’s no chance of any these groups working together to offer a united platform. They clearly hate each other. 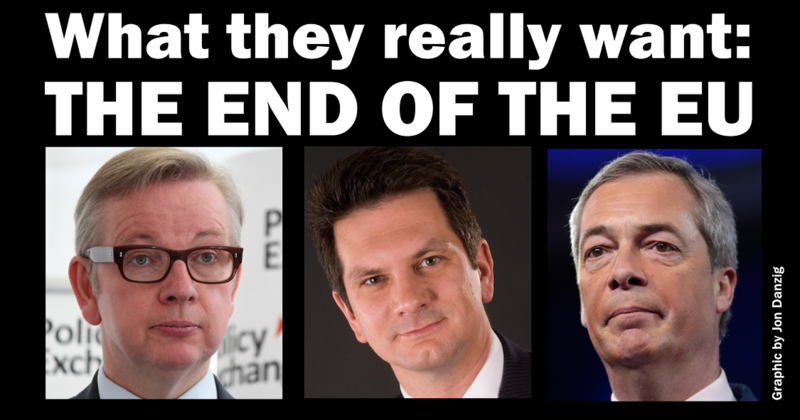 They not only want Britain to leave the EU – they have also left each other. The Trade Union and Society Coalition has threatened legal action if either ‘Vote Leave’ or ‘Grassroots Out’ are chosen. 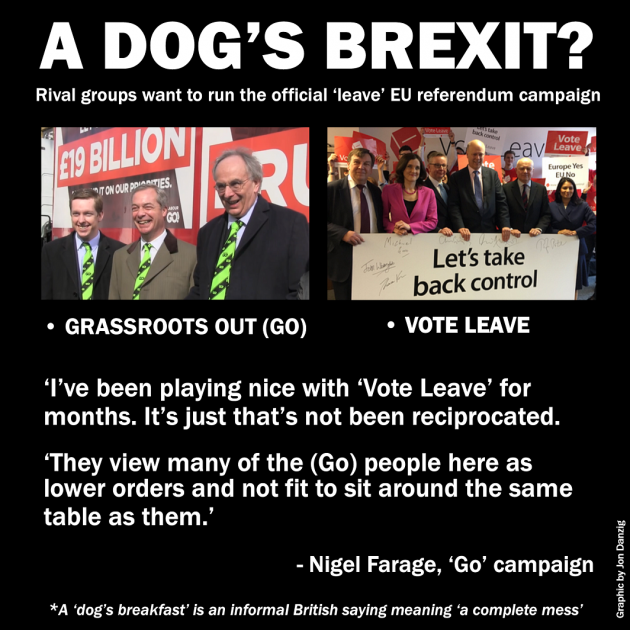 ‘Vote Leave’ refuses to work with Nigel Farage and his ‘Grassroots Out – Go’ group. 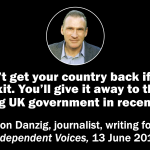 But it is external, rather than internal dissent, that seems to be driving apart the disparate – and increasingly desperate – Brexit campaigners. Last week Nigel Farage and his ‘Go’ team arrived at the Electoral Commission to deliver 13 crates of submissions that they hope will persuade the Commission to pick them. That is assuming the Commission has time in the next few days to read the 50,000 ‘Go’ documents which arrived with a huge anti-EU ‘Go’ truck (manufactured, I should add, by Renault). The ‘Vote Leave’ campaign adopted a different strategy. They sent their application to the Electoral Commission by email. “I’ve played nice with Vote.Leave for months. It’s just that’s not been reciprocated. But the truth is that there is no coalition of Brexit campaign groups, and they are not working “happily and harmoniously” together at all. On the video the ‘Go’ campaign truck is shown with a sign declaring that Britain should keep its £19 billion annual payment to the EU. But surely voters won’t be fooled by that fib anymore? Most people in the country should know by now that the UK’s NET contribution to the EU budget last year was around £8.5 billion – not even close to £19 billion. Mr Farage opened the video by saying that non-EU countries also participate in Erasmus, which is true. But as Erasmus is an EU funded scheme, Mr Farage is in no position to say whether or not UK students would still be eligible if Britain left the EU. And Mr Farage didn’t let on that upon Brexit, British students planning to study in other European countries are likely to be charged the high tuition fees that non-EU students face. It’s also on this video that Nigel Farage confirmed that the Brexit campaigns are so far apart that they can’t even sit at the same table together, let alone properly talk and work together. He hoped though that, after the country votes for Brexit on 23 June, the Brexit campaigners can then, “disagree with each other vehemently”. Is this some sort of double-talk? But think about this. If the country votes for Brexit and these people are in charge, what sort of deal would they achieve for Britain’s departure from the EU? Would they need two tables to sit opposite the EU’s one table? Would it all be lost in translation? Would we get two or more deals, and then need another referendum (or more)? This is all looking like a complete mess; a dog’s Brexit. Who’s going to vote for that? Seeing is believing, so have a look at this video for yourself. And do the Remain campaign a big favour. Share the video widely (along with this blog, of course) with all your friends, family and co-workers. There is only one official ‘Remain’ campaign, so only one name to remember: ‘Britain Stronger In Europe‘, with a credible plan to keep Britain in the EU; with the support of the government, a number of Conservative MPs, most Labour MPs and the Labour Party, LibDems, the TUC and most trade unions, many leading businesses and ordinary voters; all talking with each other and our allies in Europe; all around the same table; all grown-up and very sensible. I know who I’ll be voting for.. This entry was posted in Current Affairs, Democracy & Citizenship, Economics & Trade, Global & International, Media & Communications, Politics & Public Policy, The EU and tagged brexit, Britain Stronger in Europe, EU referendum, European Union, Grassroots Out, Leave.eu, Nigel Farage, Remain EU, Trade Union and Socialist Coalition, TUSC, vote.leave. Bookmark the permalink. Next: Will older people decide the EU referendum? 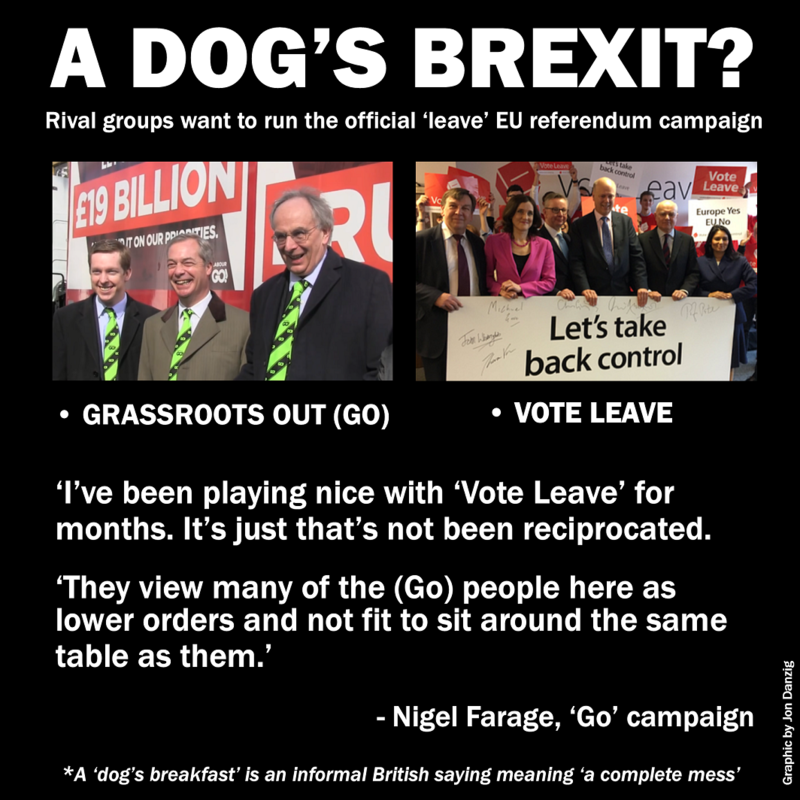 5 Responses to A dog’s Brexit? But, it won’t be up to any Leave campaign to decide HOW the UK leaves the EU. This gallant group of bloggers, made up of ordinary people who’s only wish is to return democracy to the UK and then work for a truly democratic European “community of equals”, have worked very hard to create a plan that removes the UK from the EU’s political clutches, whilst not doing too much damage to the UK’s relationship with the EU. Another Europhile trying to give the impression that he is offering some sort of impartial informed analysis, yet he defers to selective data himself. You forgot to mention that English tuition fees are one, if not the highest in the EU, so any English student studying in the EU outside of Erasmus is likely to be paying lower fees than they would at home. That may be so Raddiy, but you miss the point that Unis in EU countries offer courses at different rates of fees to students from other EU countries than to those from non EU countries. 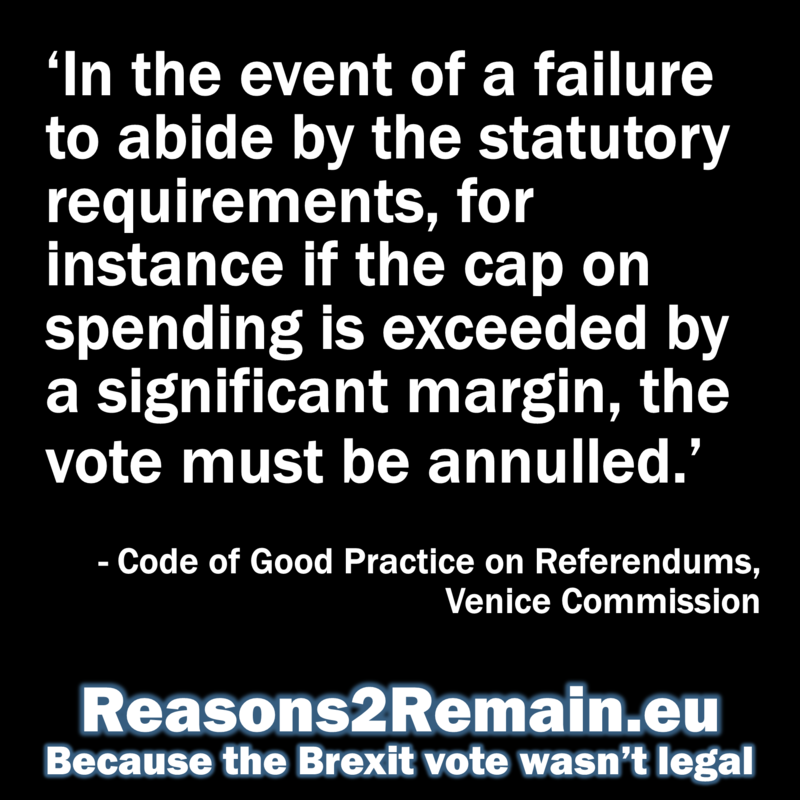 As a non EU country our students would have to pay the higher rate of fees. Absolutely wg. It will be the responsibility of the government of the day to pick up the pieces of a Leave vote. However it is the responsibility of the Dog’s Brexiters to offer a vision, based on a strategic plan, to voters to let them know what to expect in the event of a Leave vote. I note with interest that the Leave Alliance has such a plan. It would be a jolly good idea if you share it with the Dog’s Brexiters so that they may present it to voters. To try to inform people more about the issues I too publish a blog. I post about a different issue every two days, so far there are 26 posts and you can see them at http://www.poitoucharentsinphotos.wordpress.com.